At least one person has died since Hurricane Harvey slammed into the Texas coast near Rockport and Port Aransas, local officials said Saturday. Aransas County Judge C.H. “Burt” Mills Jr. said at a news conference that one person in the county was killed after being caught in a fire in their home during the storm. Mills, who grew emotional as he spoke, said his community was nonetheless staying strong and that it was shocking to see the damage brought by the storm. “When you see some buildings that you thought were going to be here forever – and some of them have been here forever – gone, it’s shocking,” Mills said. He said 12 to 14 people also suffered minor injuries. Aransas County Sheriff Bill Mills told the Corpus Christi Caller-Times 30 to 40 others remained unaccounted for as of Saturday night. Harvey moved farther inland since coming ashore late Friday night, and by Saturday afternoon it had been downgraded to a tropical storm. 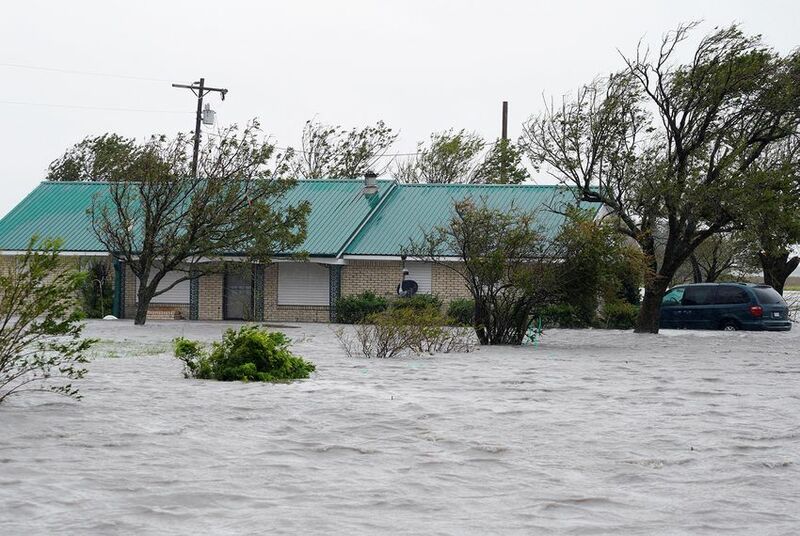 But it's already wreaked havoc on buildings along the Texas coast, and it is expected to hover over the state's southern coastline and dump heavy rain for days — prompting concerns of possibly disastrous flooding. Meanwhile, Gov. Greg Abbott and top emergency officials announced Saturday that the state’s search-and-rescue operations had begun in earnest. Speaking to reporters in the state’s basement emergency operations center in Austin, the governor said Texas had roughly 1,000 people assigned to search-and-rescue operations across various state agencies. Video posted to Twitter appeared to show military vehicles arriving in Port Aransas, where Harvey overturned buses, flooded streets and stripped shingles from roofs. The same day, aircrews with the U.S. Coast Guard rescued 17 people from different boats and vessels along the state's coastline, CBS News reported. Asked Saturday afternoon about the number of deaths from the storm, Abbott said he could not confirm any fatalities and was working with local officials to gather more information. Shelters in San Antonio and Austin were filling up with grateful Texans who had fled their homes, Abbott said, and about 1,500 evacuees were staying in state parks. At the same time, officials in multiple cities warned of downed power lines, broken traffic lights, and streets filled with debris. Hundreds of thousands of Texans were without electricity Saturday and, in some areas, residents were asked to restrict their use of toilets and faucets because of outages at wastewater treatment plants. The city and county of Victoria imposed a curfew on residents Saturday — lasting until 6 a.m. Sunday, and then resuming Sunday evening — to allow crews to clear hazardous debris and protect residents’ safety, officials said. Elsewhere, vehicles from the Department of Transportation and other authorities were shown clearing roads and assessing damage. Forty inches of rainfall could pour down on waterlogged areas of the state before the storm dissipates, according to the National Weather Service. Texas’ primary safety concern, Abbott said Saturday, was the prospect of serious flooding. On social media, Texans shared images of brackish waterways swollen or overflowing from the storm. Harvey, the most powerful storm to strike Texas since 1961, first reached the Texas coastline late Friday. The scene in Rockport, which bore much of the brunt of the storm’s initial 130-mile-per-hour winds, was one of “widespread devastation,” Mayor Charles Wax told CNN Saturday morning. Property damage was rampant, he said, and the loss of cellphone service and other means of communication had hampered emergency response efforts. Local news reports from Rockport indicated many buildings were damaged overnight. After a roof collapsed at a senior housing complex, at least 10 people there were taken to a nearby jail for treatment. A portion of Rockport High School caved in. In Fort Bend County, near Houston, county officials said a possible tornado damaged homes and downed trees, the Houston Chronicle reported. Tornadoes were also reported in Galveston and northwest Harris County. The National Weather Service issued a tornado watch for a swath of the state's coast Saturday. Three state prisons south of Houston started to evacuate Saturday morning as Hurricane Harvey caused water levels to rise on the Brazos River, according to the Texas Department of Criminal Justice. The Ramsey, Terrell and Stringfellow prisons in Rosharon hold about 4,500 inmates total. Inmates will be moved by bus to other prison facilities in East Texas. The state also evacuated the three prisons last May, said TDCJ spokesman Jason Clark, when flooding brought the river to record levels. There has been minimal damage to other prison facilities in areas affected by the storm and many are running on generator power, Clark said. Abbott announced Friday night that President Donald Trump and the Federal Emergency Management Agency, or FEMA, had approved the state’s request for a disaster declaration, which includes funding to provide “individual assistance, public assistance and hazard mitigation” in Texas. White House Press Secretary Sarah Huckabee Sanders said Friday that Trump plans to visit the state next week. Additional reporting by Bobby Blanchard and Jolie McCullough.